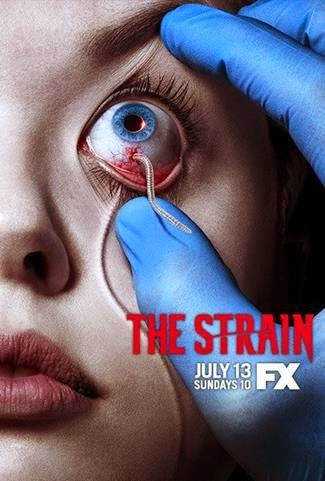 The Strain TV series is an adaptation of the trilogy horror novel by Guillermo del Toro and Chuck Hogan, chronicling the infiltration of New York City by something... threatening. I thought it would be good to see the book series realized to TV, but as the pilot episode developed, I saw that there was quite a bit of extra content injected into the start of the trilogy. Content that wasn't in the book or came at a later point in story time was added to the opening and it felt like there were details pandering to the base desires of TV viewers to give more "meat" to the story to fill out a season of TV. The book series dwelled heavily on the mystery of the airplane, keeping the reader riveted. In the TV series, we bounced around a bit and touched on issues early that come to light later on in the novels. But I am not giving anything away. My test TV crowd found themselves curious about what is taking place in the story. Who or what is this large creature? Who or what are those businessmen? What's the old man got to do with anything? If I detach myself from the books, then the series premiere of The Strain delivered a great start to the story the series will be delivering. And in this incarnation, we hear from the opening and closing monologues that love is our weakness. That love can be preyed on. I think the show has a strong start and if they keep this balance of detail they're delivering, viewers should be kept riveted until the reveal of just what this threat is. And it's a rather unique new twist on an old incarnation of evil. I loved it and I hope it translates well to the small screen. DON'T look up the book series if you haven't read them already. Wait for the reveal of what's going on. I think they've dropped enough clues that the viewer knows what's up. Regardless, I think we're in for a great TV entertainment ride.